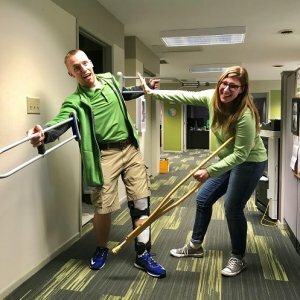 We’re not sure who’s going to win this crutch-assisted footrace down the Sidney office’s hallway: Kyle on a newly repaired knee, or Kecia on a newly repaired ankle. Whether there will be post-race repairs needed to their pride remains to be seen. We’re pretty competitive around here, in case you haven’t noticed. Mitch has been deemed faster than electricity (but not the tallest). Andy is typically competing for the first snacks. Mike G. is the first to the thermostat. And if you missed the Loveland Charity Cup two weeks back, you can witness the highlight video featuring our typical, ultra-competitive nature (not to mention our obvious need for speed!). We hate to see anyone injured, but if these two would knock each other down, perhaps it will knock some sense into them. Plus, if Kyle and Kecia are on the ground, the rest of us have a better chance of winning whatever it is we’re racing towards!